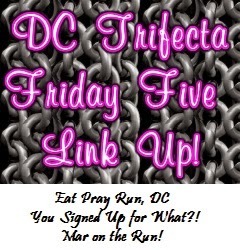 The Friday 5 this week is all about Indoor Fitness. Since both of us are having problems with our legs, we've been doing lots of indoor activities lately. 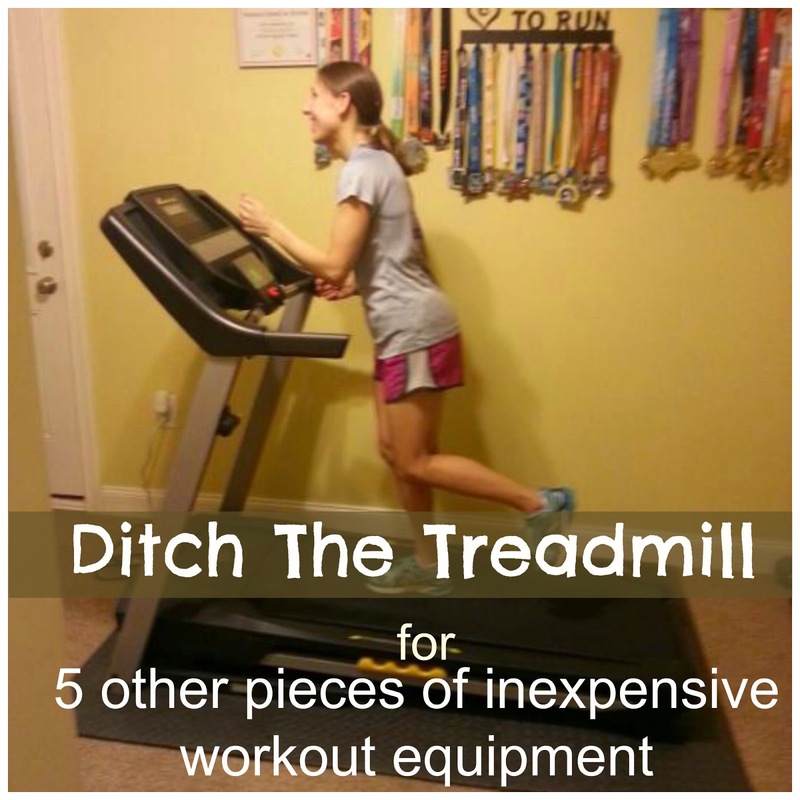 When you don't feel like running outdoors ( or it's a little too cold or snowy), you automatically think of the dreaded treadmill. We both have been physically unable to run for a while so the treadmill has not been an option for us lately. We have found that we can still get in a good work out with these other simple pieces of equipment. 1. Fitness Ball: This is probably one of our favorite pieces of equipment to use but it can be dangerous if you don't use it properly. Balance is key. You can use it in a multitude of ways. Sit on it to do sit ups, strengthen you legs by using it for bridges, and lots of core and ab exercises. Since these moves are difficult to explain, we've linked to a page on Helpful ways to use the fitness ball for beginners. 2. 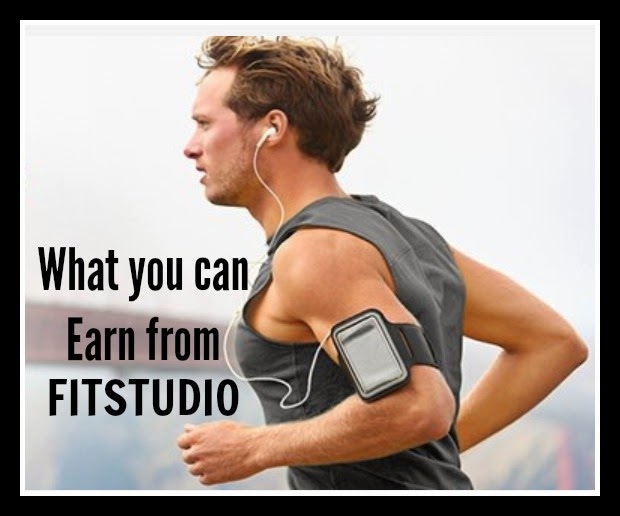 The Xfinity Bands: The Xfinity bands take the plain old fitness band to a whole new level. I would suggest using them with a video first to learn some moves, and then you can do a few stretches and strengthening moves on your own whenever the mood strikes. My sister actually did a post on the Xfinity band HERE, if you would like to learn more about it. 3. 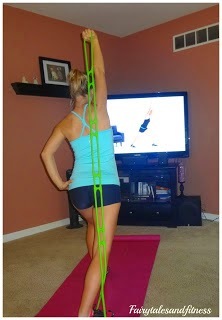 Another inexpensive item that is very is a therapy resistance band. We got some from Physical therapy and my sister has been faithful in using hers. We actually looked up the actually name of these bands and it is Physical Therapy band, go figure. You can purchase them at Walmart, Target, or any sports retailer. These are not the "tube bands". They are like really thick rubber bands and they are great for strengthening up leg muscles. Our favorite move is putting them around your knees before doing clamshells or putting them around your ankles and doing lunges. 4. Don't forget about the plain old jump rope. Nothing fancy about this one. A jump rope is great cardio. 5. Ankle weights are a joy. You can strap those on and do almost any activity. Here is an example of how you can build strength in your upper legs and help a tight IT band or Hamstring. Seated IT band/Hamstring stretch: You can't tell in this picture but she has 3 pound weights strapped to her ankles ( You can use which ever weight feels right to you). You'll want to sit on a hard surfaced chair. Put a pillow under the leg you will be stretching. Arch your back as you grip the underneath part of the chair ( this is very important in feeling the resistance as you stretch). Lift the leg up until your knee is straight and then for a bit more stretch, flex your toes up. Do this 10X with each leg. Don't forget to move the pillow under the leg you are stretching. I do a lot of these exercises in the evenings while I am watching my shows. I would normally want to reach for the snacks but instead, I'll do a set a bodyweight exercises during the commercial breaks. I do a set of squats, lunges, crunches, and push ups. By the time I am finished, the commercials are over and my show is back on. It really does pass the time. And who can complain of a few more calories burned? 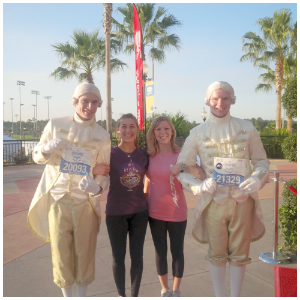 This post is for anyone who is participating in Disney's Princess Half Marathon Weekend in February. Year after year as thousands of women prepare for this race weekend, we see many Facebook posts asking what exactly the Happily Ever After Party is. Well, if you were wondering that too, this post is for you. 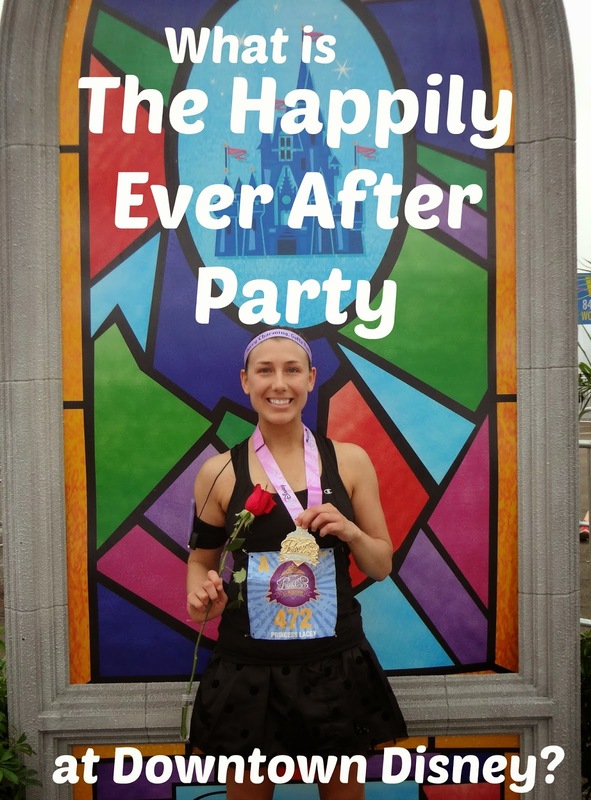 The Happily Ever After party is held at Downtown Disney on Sunday night after the half marathon. It's not so much of a party as it is a public celebration. It is business as usual at Downtown Disney and there is not a special section just for runners or anything like that. Of course things could change from year to year but this is what it has been like the last several years. There are congratulatory signs and banners up near the west side. One year they had a background set up for pictures ( your own pictures of course, no photographer was there, no characters either). There was a kiosk of left over race merchandise. (This was very limited though). when you show your medal or bib. Some even offer a free item to the first hundred runners ( or some other random number). For example a store "Little Miss Matched" was giving out free socks last year to a select amount of runners. My sister and I didn't go to downtown till later in the evening so we didn't get any freebies but as my sister would say "That's okay, we like our socks to match anyway",..lol. One year when we were there we saw a special section set up outdoors ( back in a corner out of the way) where there was a dinner being hosted. We were casually talking to someone who was there monitoring the event and they told us it was for the winners. I suppose that will be an event that we will never been invited to! I thought maybe age group award recipients were invited to that to get their awards but it seems as if those awards are mailed. So as you can see, the Happily Ever After party isn't much of a party ( unless you are the winner). If you miss it, you really don't miss anything. 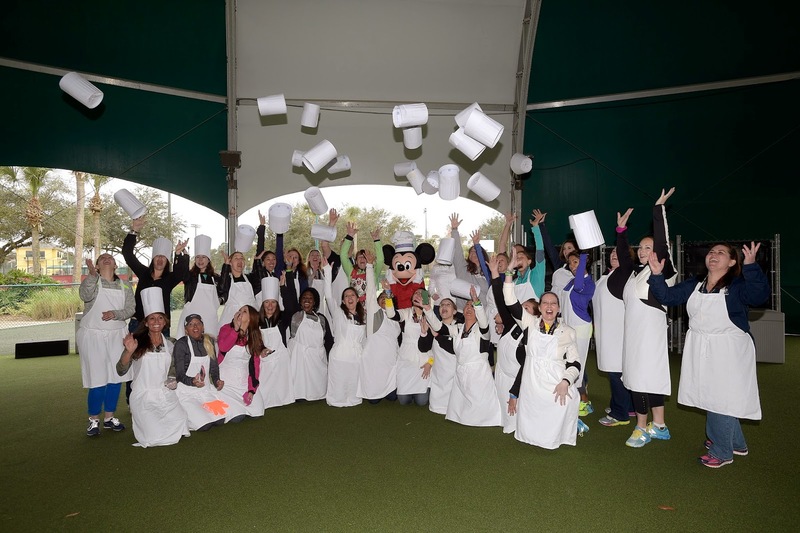 Have you been to the Happily Ever After Party at Downtown Disney? If so, did you see anything special? Every race that we do, we always want to improve, right? 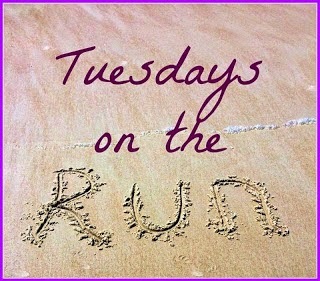 When I found out the topic for this week's Tuesdays on the Run was what was your worst race and what did you learn from it, I had to think quite a bit about this one, because honestly I don't think I had a worst race. How do you define a worst race? Is it not PRing? Is it not feeling well during the race? Or maybe fighting an injury throughout it? I decided that my worst race actually ending up being my favorite race. Let me explain. Last year you may have recalled that my sister was going to run the Big Sur Marathon with me for her first marathon. Due to the injuries she encountered during her training she was unable to do it. I told her since she was unable to do that race, I would run the Disney World Marathon with her the next year as her first. 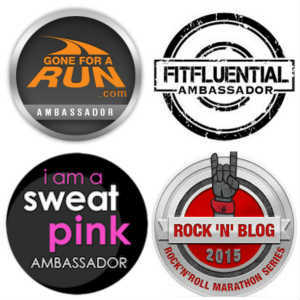 It was my first a few years ago, and I believe it is a perfect first marathon to run. Since I had run the marathon in the past I told her that I would like to challenge myself and run the Goofy Challenge. I would run the half for myself then make sure I would be at the starting line with her during the marathon. A few days later she said to me "well if you are running the half I should too." Well surely I couldn't let her run it by herself. And plus she loves putting outfits together so we would have to run together in order for great pictures, right? Well there goes my chance of PRing in any of the races. At first I thought to myself, I was setting myself up for failure. Who signs up for a race knowing that they are not going to run it at their full potential? Well I have to say, training for this race (or lack of) was the most enjoyable. Before races I tend to stress myself out with many things, but I had absolutely no stress at all. There was a part of me that half felt bad. 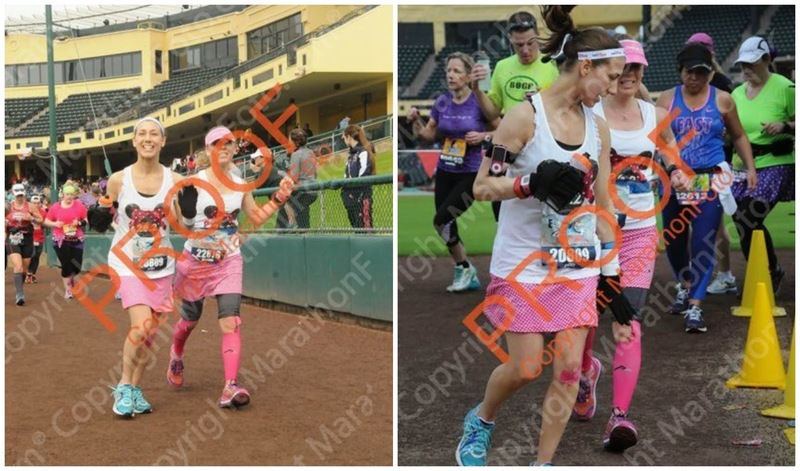 Here is my sister in a strenuous training program for her first marathon and has encountered many injuries along the way, and here I am just breezing through. Either way I told her no matter what happens, I will be right at her side through the whole thing. We were placed in the middle of the corral pack. Normally I am in the front of the corals that quickly spread out so you can find your own pace. This was a little different than what I am used to. I am used to getting through the parks quickly and seeing (or not) certain things because I am used to running the majority of it in the dark. This time, while running the sun came out and I actually saw things that I never noticed before in past races. It was actually approaching daylight as we came up on Main Street in Magic Kingdom. I've only ever run on Main Street in the dark (with the exception of the lights from the park). 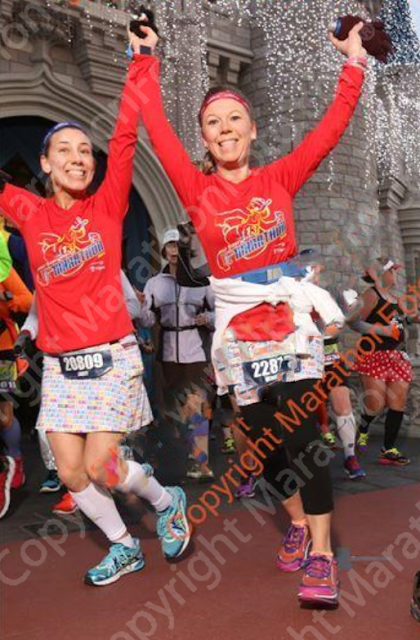 We took time for some pictures in front of the castle during each race(something I would have never done if I was running by myself). Just hearing the music in the park and the excitement as we ran through was pure joy! We ran all 39.3 miles that weekend without listening to our own music (another first for me). This allowed me to read more signs and interact with the crowds. I even took some pretzels from a lovely lady handing out snacks. 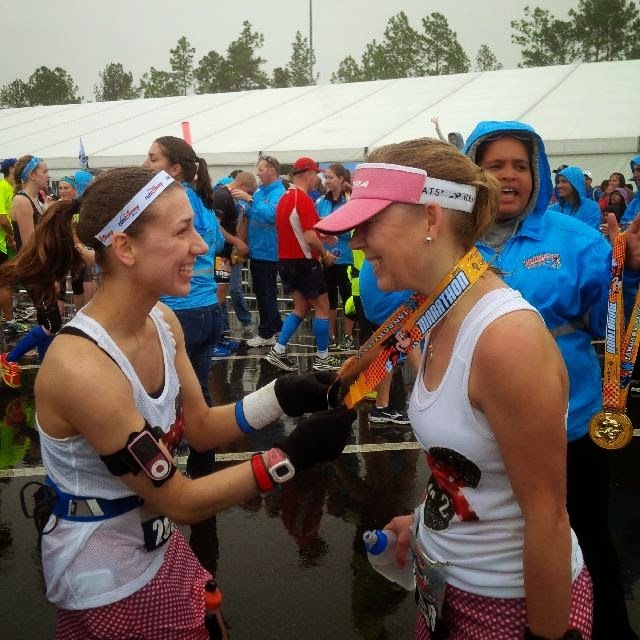 When preparing for the marathon, there were several things my sister asked me from my previous experience ( like about the Expedition Everest roller coaster. I had no idea about this because when I ran through Animal Kingdom last time, neither the park nor the ride was open). To be honest, I could hardly answer any of her questions because I didn't remember much. Buzzing through the parks, mostly in the dark, listening to music through your own headphones does not make for such a great race experience. It might be the makings of a new PR, but that's about it. As with any Run Disney weekend, I am usually the one that is in charge of putting together our race day outfits. Since we are having a snow day today I thought today would be a good day to work on putting some more outfits together. Our mom will be running all 3 of the princess weekend races with us at Disney next month, so not only do I have to think up and put outfits together for Lacey and I, but I also want our mom to coordinate with us. A lot of our costume pieces this year will be recycled pieces from years past. Here is just a peek of what I already put together this weekend. 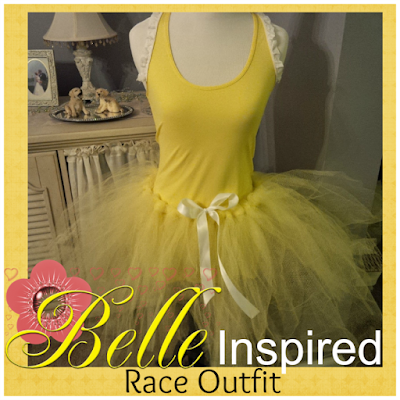 I am working on this Belle costume but to be honest it may be too "poofy" for any one of us to run in. It needs a few more touches to it too. 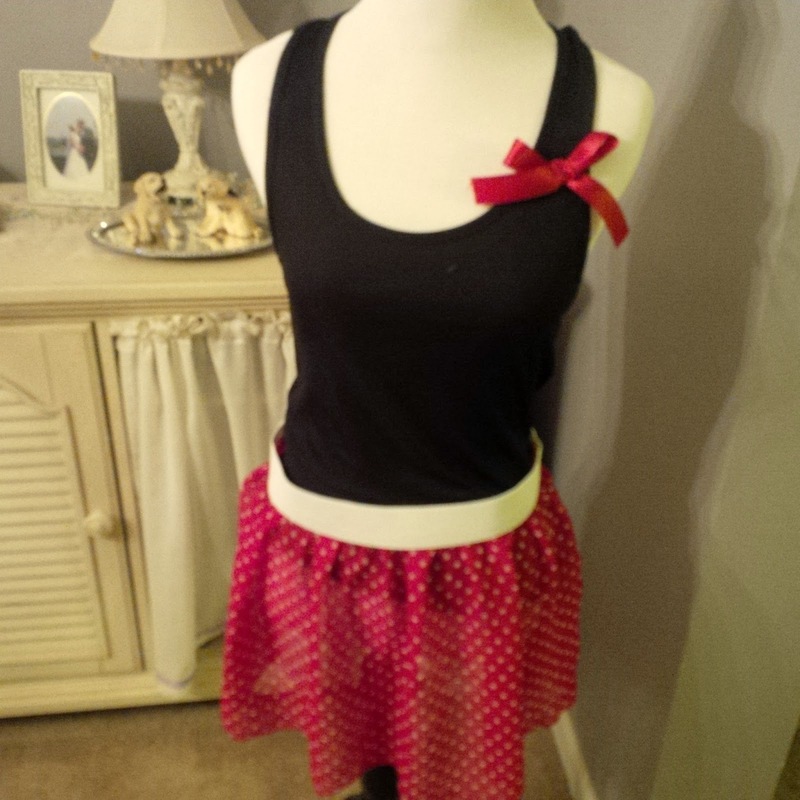 You will for sure be seeing us in these "Minnie" inspired outfits on the course. For which race, I'm not quite sure yet. We still have to coordinate some other outfits with each other. The theme for this Friday 5, hosted by Courtney, Mar, and Cynthia, is "about us". Well the thing about us lately is that we've both been hurting. 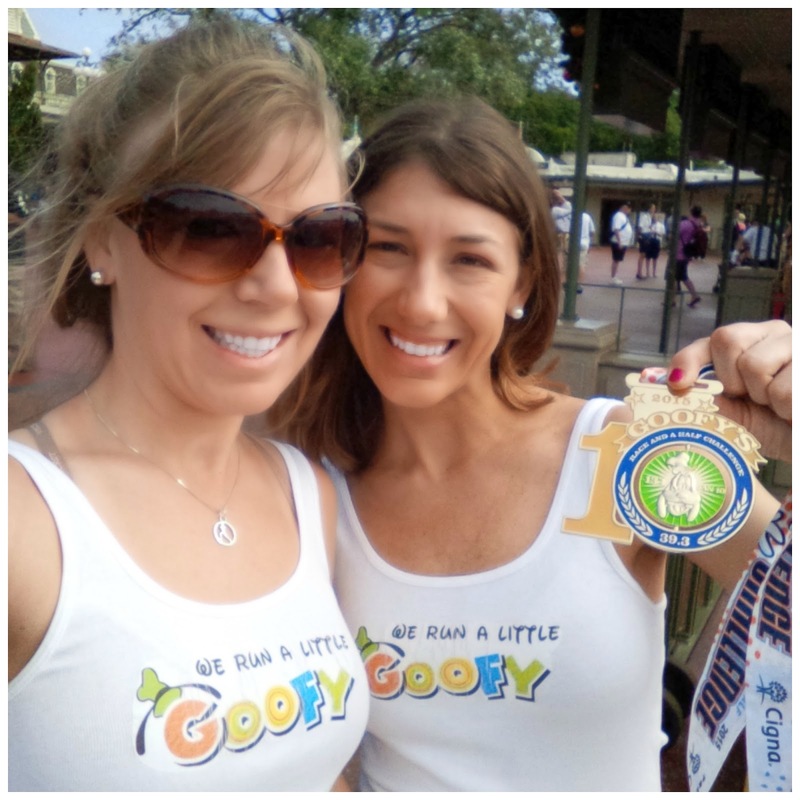 No, it's not because we just finished the Goofy challenge which was 39.3 miles of pure magic..haha. We both have been hurting since RnR Vegas in November. I've had the whole knee tendonitis and IT band thing going on and Lacey has had a pain on the outside of her knee that's been slowing her down a bit. Here are some common things we've tried and our take on it. 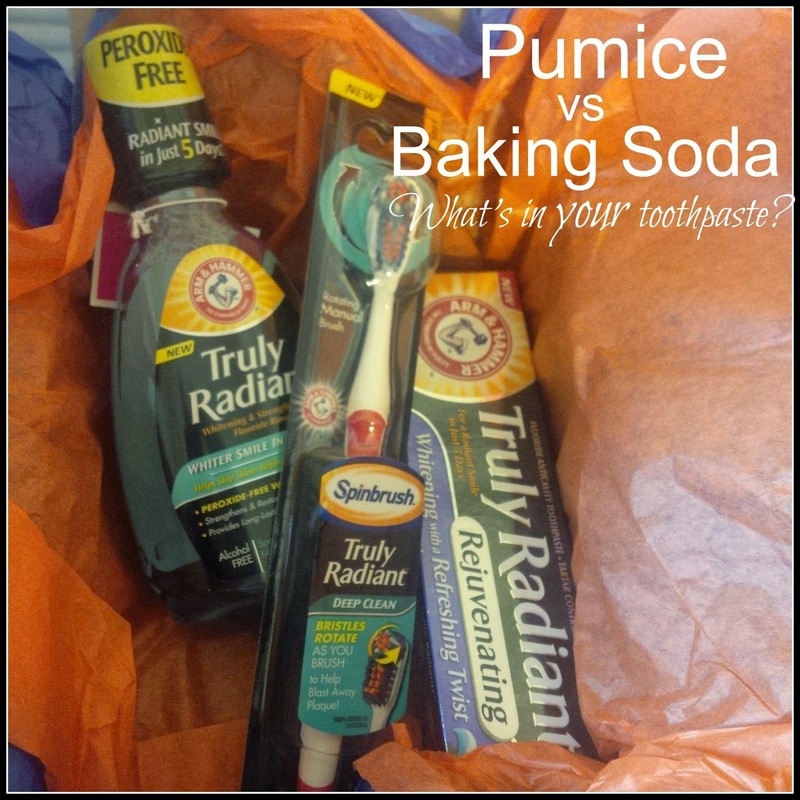 Let us know what you think of these products. 1. KT Tape: I have read so many blogs where the runner has said KT tape saved their running career or they could not have gotten through a race with out it. I had high hopes for this tape. Unfortunately this has not worked for me. I will admit that my pain may be more serious than what Kinesiology tape can fix. I have the opportunity to try out Rock tape but I have a feeling that will be no different. 2. Tiger Balm: This is an old remedy that has been introduced to us. My mom has used it on some sore spots and says it works like a charm. I will admit that it does sooth my pain for a bit. 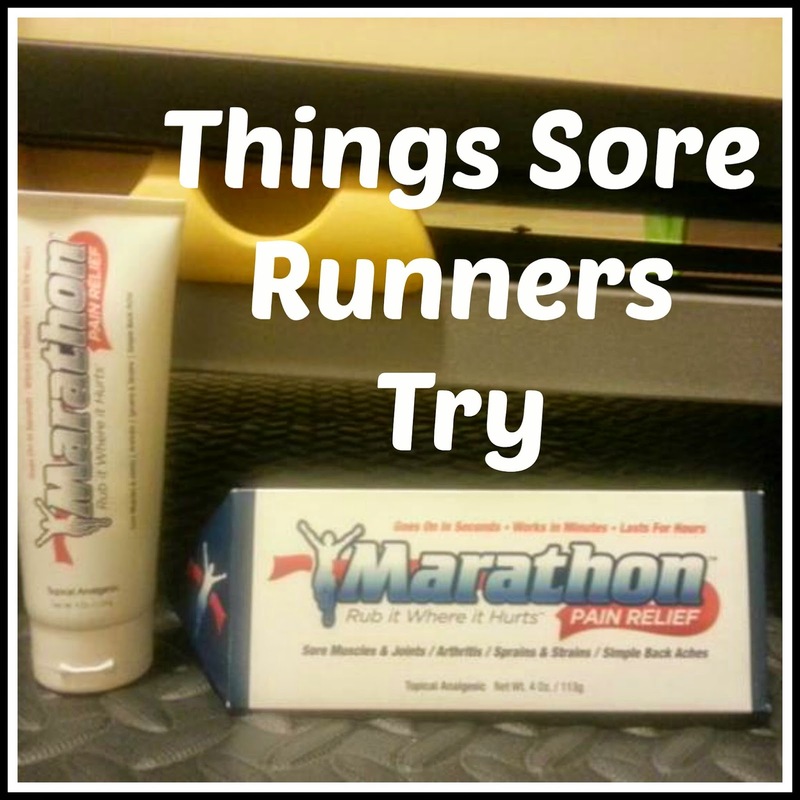 Http://www.marathonpainrelief.com and check out the testimonies. 4. 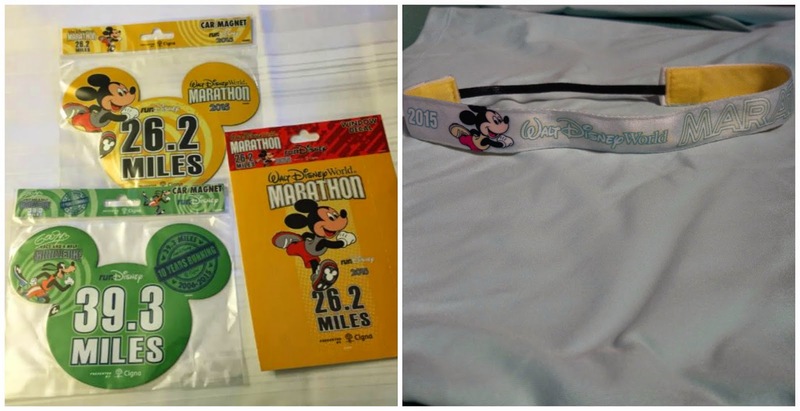 Knee Straps: I picked up a knee strap before the WDW Marathon weekend. It said that it was for people who had knee tendonitis so I decided to give it a try. I did a trial run on the treadmill ( of only one mile) a few days before I left for Florida. hen I put it below my knee it just slipped off. I put it above my knee like I've seen other runners do and that sort of put pressure on the muscle ( in a good way) to prevent in from hurting. I got through the mile with no pain and thought I had a winner. Unfortunately the strap didn't do anything for me on race day. 5. And when we are not running, we have been stretching and icing and of course foam rolling and using the massage stick and all sorts of other massage tools we have. We've also been taking lots of Epsom salt baths too ( which prove to be more for relaxation then anything else). Lacey is going to continue to nurse her knee and rest and ice until Princess weekend and see how it goes. I will be returning to the Orthopedist for another consult. Other runners have suggested ART therapy for me, which I tried to have done at my Chiro last year but he wouldn't perform it because he said it would hurt too much. And just recently someone mentioned Dry Needling to me which I believe is some sort of acupuncture from the little that I've researched. Would you try dry needling? What things do you use when you have pain in your legs/knees? Hello readers! We love looking at official race merchandise, even if it's not from a race that we are even running. Last spring we were loving all the official merchandise from the Nike Women's half marathon in D.C that our friends were posting online. 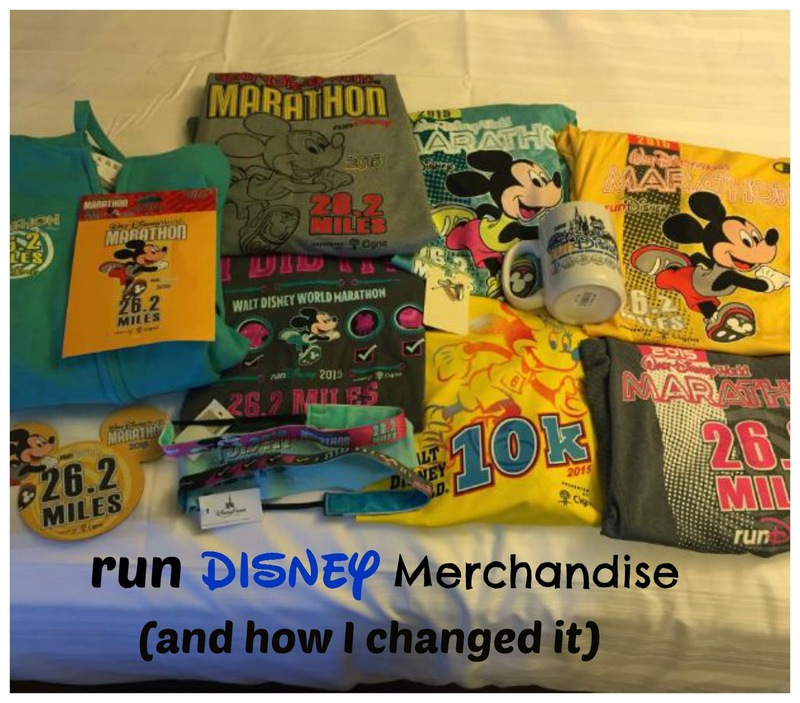 For that reason we thought we would share with you some of the official race merchandise from the Disney Marathon Weekend. We'll show you what we liked and what we weren't that fond of. 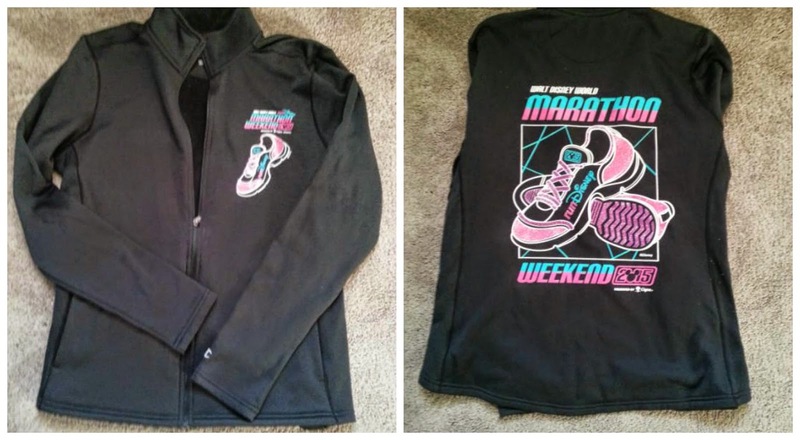 Let's first start with the official marathon jacket. 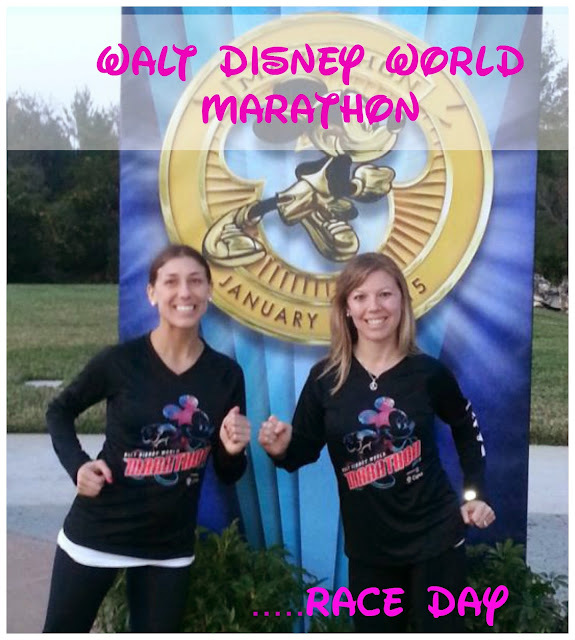 This was the pre-order jacket that my sister and I ordered when we registered for the Goofy challenge back in April. When I first saw a picture of this jacket ( that my friend had sent me from the expo), I wasn't very pleased with it. After seeing it in person, I have to say that it wasn't as bad as the pictures made it look. It is made of a tech material and it fit nice but I have to say I still wasn't loving the design. I kind of felt like it had a retro "break dancing" look to it. When I picked mine up at packet pick up I was able to promptly return it right at the same spot. If you ever decided that you do not want to keep any of your pre-order merchandise, be sure to bring your registration receipt. That makes it SO much easier to return. Although I returned my jacket, Lacey ended up keeping hers. 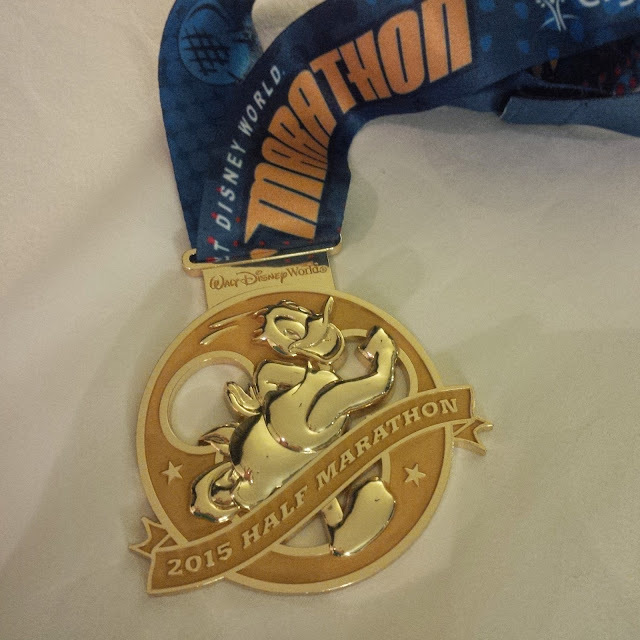 Another item I pre-ordered was the marathon necklace. 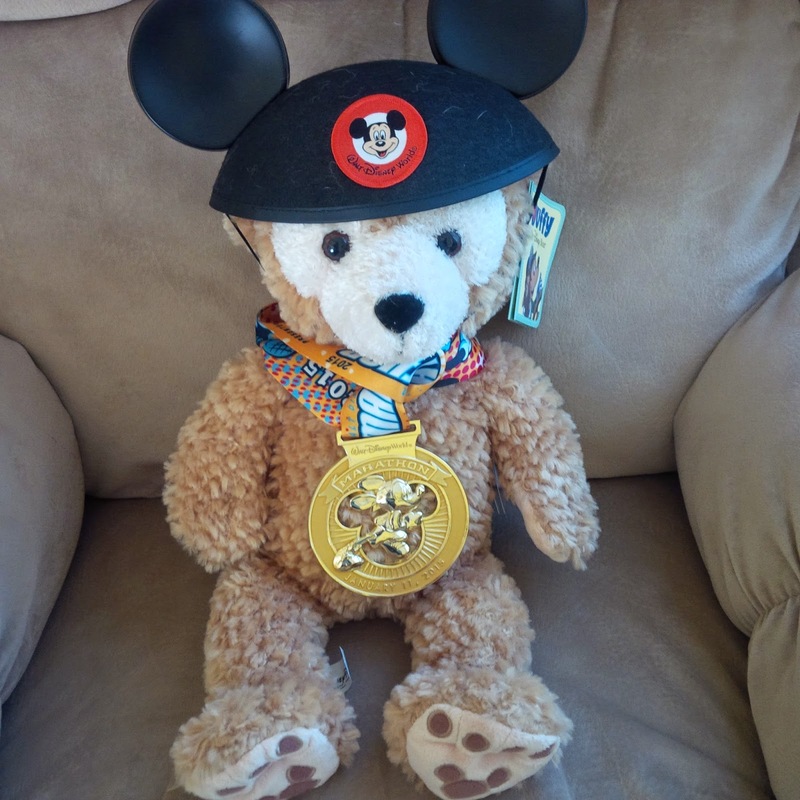 Lacey had got one when she ran her first Disney marathon in 2013 and I thought it was cute. When I picked my necklace up I wasn't impressed. It was a shoe charm on a chain. There was nothing Disney about it. Not even a 26.2 on it. So guess what. I returned that too. So far I was getting away cheap at the expo! Ok, so here is where I started spending more money. Funny that all the merchandise that I did buy was all the same teal color. I liked that they had this color of official merchandise. I am loving the long sleeve marathon shirt but I will say that after only washing it one time ( on cold) that I can see the screen print starting to crack. This champion merchandise is nice and all but so not worth the price that you pay for it. But then again, it IS at Disney and you are paying for the name and the novelty. Since I didn't get the jacket that actually said "Disney Marathon" on it, I had the words embroidered on the teal sweatshirt I bought. Take note that the only place to get your apparel embroidered at Disney is in Hollywood Studios. I didn't find this out until the last day of our visit so I had to get mine done at home. I think it turned out great though! 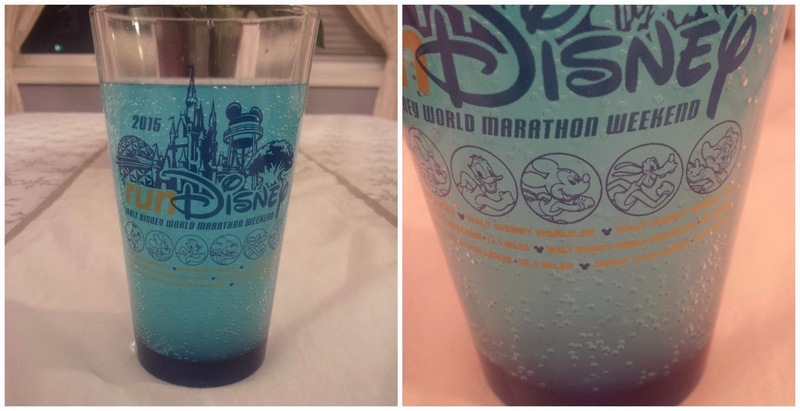 I was looking for a Marathon glass but could only find general ones that said Run Disney. I then noticed that each race in the marathon weekend was featured below. Of course we had to pick up our race magnets ( My first marathon magnet)!!! I also picked up my first Marathon sweatyband. It doesn't photograph well but it is a light teal color and matches the long sleeve shirt above very well! Here are a few other things from the expo. Our friend Heather bought these jackets. 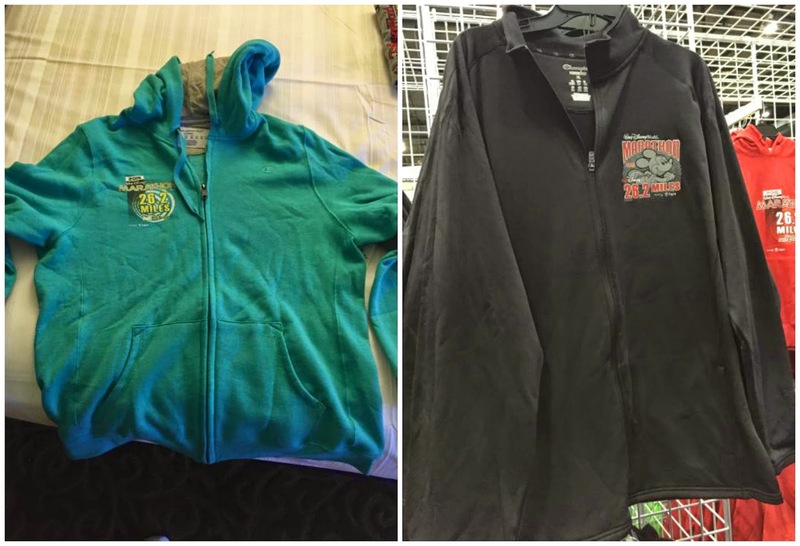 The first one is a sweatshirt jacket and the second one is a tech jacket. Phone covers and a few more sweatybands and a bondi band our friends Heather bought! And in case you hadn't seen, here is what the official race shirts looked like. 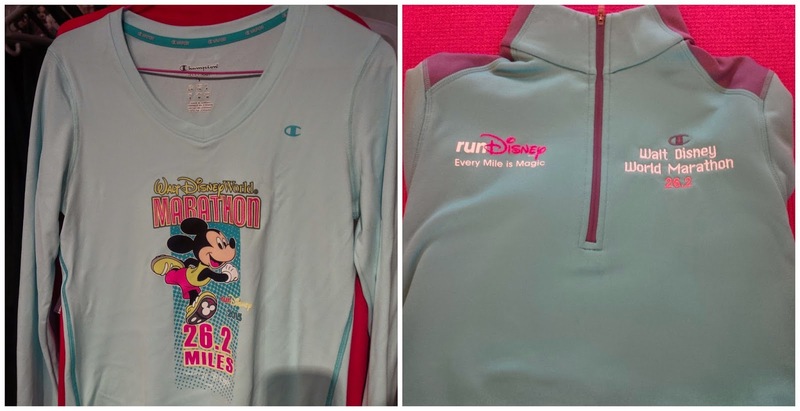 Although we did see a peek of the Dopey shirt before we left for Disney, we made sure we didn't see the Marathon, Half marathon or Goofy challenge shirts because we wanted to be surprised. I REALLY liked the race shirts last year and the marathon shirt for 2013 was really nice too so I was kind of bummed when I saw the shirts this year. I thought they also had a retro look to them. I'm actually okay with the Marathon shirt because afterall it is my first marathon shirt so I would like it anyway, but the Goofy challenge shirt is just hard to read and really see that it is Goofy. I didn't notice until I got the shirts home that the goofy and marathon shirts have all four park logos on them because we ran through all four parks. The half marathon shirt has 2 park logos on it because we ran through two parks. I thought that detail was cool. Overall, we were both pretty pleased with the merchandise. We didn't get to the expo until Friday and they still had a great selection of things. My only regret is that since I was so focused on the full marathon, I didn't really give the half marathon the attention it deserved. I wish I would have bought some half marathon merchandise. Why you should pack gloves for your next race even if it's warm. Later on Sunday evening when all the races were completed, we wanted to get a few pictures with our medals when we went out for dinner. We only wore the Goofy Challenge medal but we packed the other medals in our bag and brought them with us. 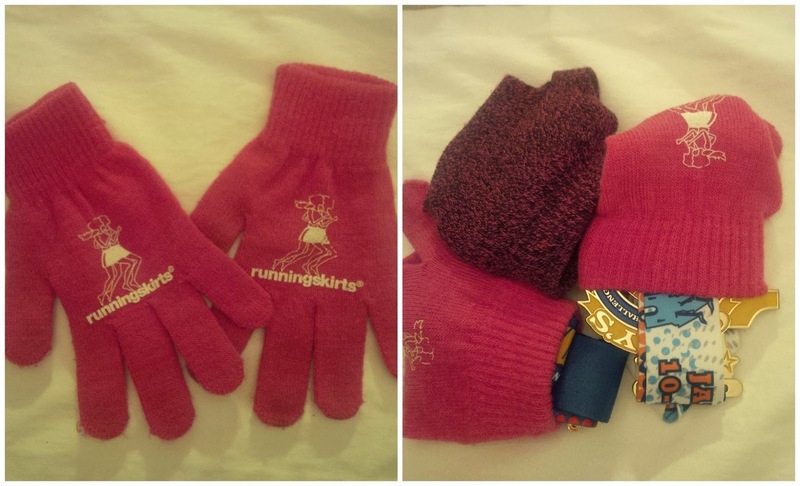 Before we threw our medals in the bag, we put them inside our stretchy gloves. The medals actually did fit all the way inside these stretchy gloves and they were protected quite nicely. I left some of the medal hanging out just for the sake of the picture. This prevented the medals from banging up against one another as we toted the bag around. We also put the medals inside the gloves when we placed them in our carry on luggage before we boarded our flight home. This worked our perfectly and a little tip we will remember when we participated in other multi- race weekends. 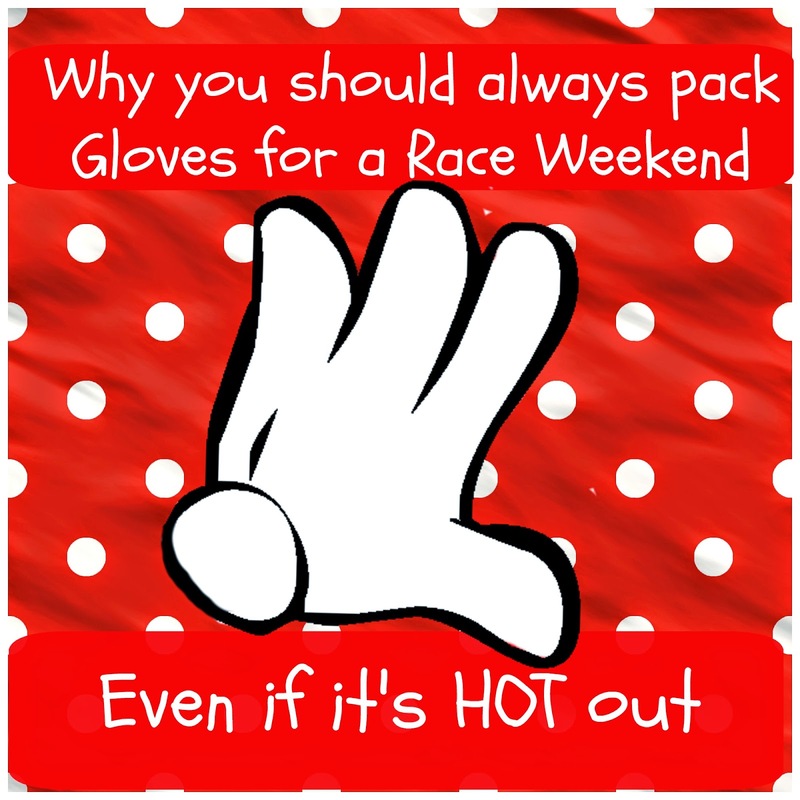 We'll even be packing some stretchy gloves when we run the multi race weekends in VA beach even though it will probably be 98 degrees! I suppose you could do the same thing by putting the medals inside your socks, but I don't like to stretch my socks out and these stretchy gloves work perfect! Do you pack your medals with care when you travel home? Do you take ALL your medals to the parks with you? The Saturday that we were at Disney, we hosted a meet up. This was a chance for us to meet a lot of our blogging and running friends who we have shared stories and encouragement with over the past few years. Some we have met before and others who we have just met felt like old friends. We want to thank everyone that took time out of their busy day to come meet with us. Almost everyone here had just ran the half marathon a few hours before so I know resting was probably high on their priority list (or having some park time). 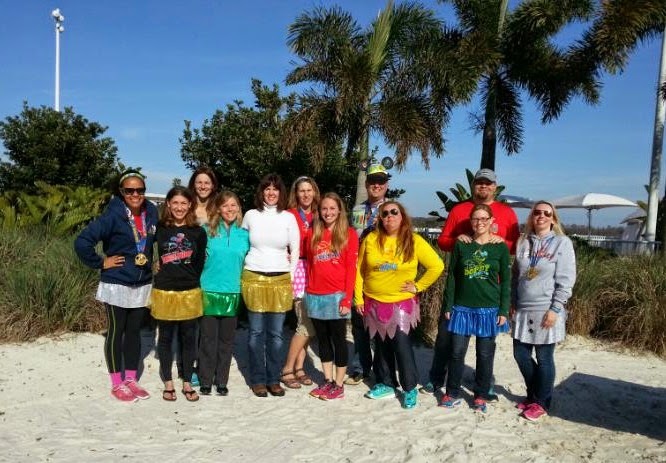 We want to give a special "Thanks" to Mary Beth from Tutus and Tennies because she was not running this weekend but since she is a "local" took the time to drive over to Disney just to meet with this lovely group of runners and bloggers. Isn't that sweet? Since Disney transportation isn't the most reliable, we ended up having two groups of people come at different times. Our blogging friends: Juliana from 4WellRules, Lacey, Amy from Rock City Skirts, Meranda, Mary Beth from Tutus and Tennies, Lois, Author of the Running to Disney Facebook page, Gabby from The Running Goober, Walt and Monica (Disney Groom and Disney Bride) from Running Happily Ever After, Lauren and her husband Robert from Lauren's Glass Slipper, and Denise from Healthy Disney Family. In this group we are all Rockin the Skirts from Rock City Skirts. Everyone was able to pick out a skirt to keep! I know a few runners who even wore their skirt for the marathon the next day! These are our tall friends....just kidding. We know them from the Running to Disney Facebook group. 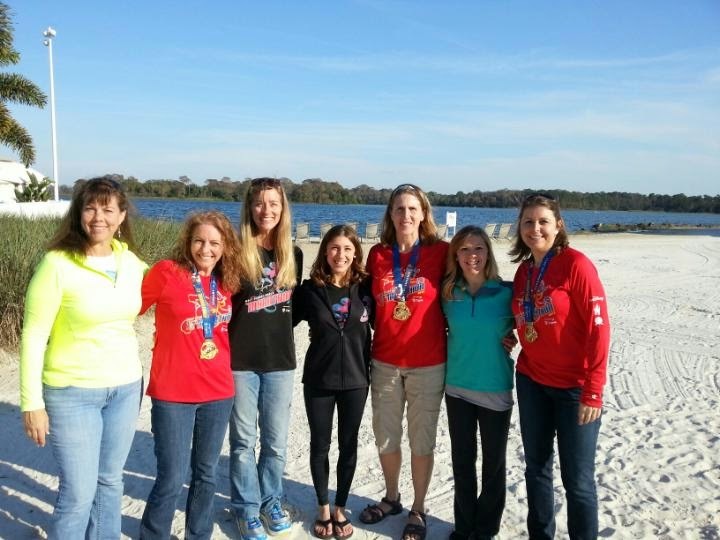 Jeanne, Cori, Lisa, Lacey, Lois, Meranda, and Peg. Lara bar supplied us with a TON of snacks for the occasion. We had so much that everyone at the meet up got to fill their bag and then we made them take bags for their families and friends. We had so much left over that we left some for the "mousekeeping" staff at the Contemporary and even handed them out while we were waiting for the Magical Express! We had some generous sponsors who gave some door prizes to be given out as well: Shirts, hats, magnets, books, supplements, water bottles, running fuel, lock laces, etc. Remember that fancy Running Journal from Gone For A Run that we reviewed earlier this month? Well Gone For a Run gave us an extra one as a giveaway for this meet up. That was won by Disney Groom! We are sure he'll have that filled up in no time! In a few weeks we will be packing our bags and heading to Disney again for the Princess Half Marathon weekend. Unfortunately we will not be hosting a meet up like this one. We are both running 3 races and need all of our luggage space this time. There will be no room for snacks and giveaways! However, if anyone wants initiate a meet up, please let us know! After the previous day's half marathon, I was pretty bummed out. Not because of my performance, but because of the pain that came back and what that might mean for the Marathon. I knew that I was going to get through this race, but I didn't train all that time to "just get through it". Even if I was in pain, there was no way I was going to walk this marathon. That is not what I came to do! Even though the weather for the marathon was much warmer then the day before, I still decided to wear compression pants. The pair I had on the day before kind of helped keep my knee strap in place, so I thought I would try that again. I don't really feel like the strap helped me the day before, but I DID get through the first 3 miles with out any pain. Weather or not that was contributed to the strap or not, I don't know but it was worth wearing if it would let me run pain free for only the first 3 miles. I had not really counted on wearing pants to race in so I only brought one pair of black ones and one pair of gray ones. Today I had to wear the gray ones. Pairing those along with my hot pink calf sleeves, I totally wasn't making any fashion statements today! When I was in the medical tent the day before, the nurse had asked me if the pain is more or less when I run faster. Sure enough, it is less painful when I sprint and more painful when I am trying to take it slow. She said that made sense. She told me that I should try to just try to get by with doing little sprints throughout the race. My sister was nice enough to move back to a further corral so she could run with me. We had a little hiccup in the beginning because we went to use the potty before we got in the corral. The corrals had already started moving up and we ended up getting into a corral even further back. It all worked out okay anyway but word of advice, unless you are in the very last corral, make sure you are in your corral by the time the National Anthem is playing! 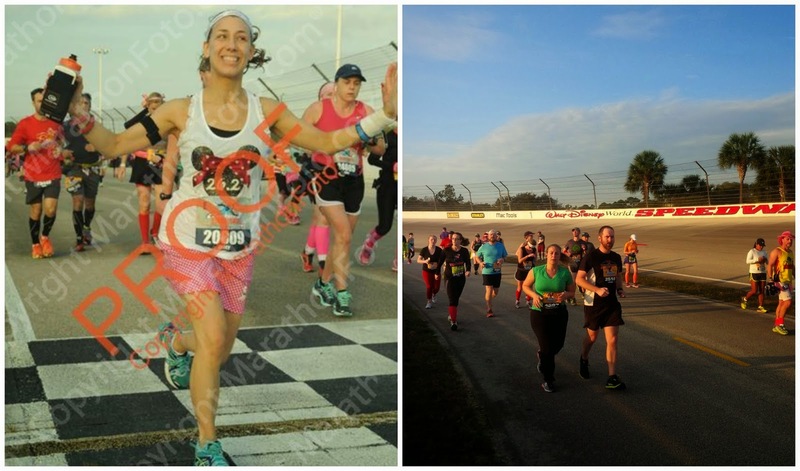 When the race started, I started off with a power walk, then a gallop, then a full out sprint. I did this for the first few miles. I even discovered that if I skipped, I had no pain. Believe it or not I found that skipping took more energy out of me than actually running. I didn't do the skipping thing anymore after the first few miles because other runners were starting to make fun of me. During this time I was so excited to see that we ran into our friend Lois and the girls she was running with. They were doing a run-walk method and I loved how she was calling out when it was time to either "run" or "walk". We tried to stick with them for a little while but because I was doing a walk-sprint, our rhythms weren't syncing up and we lost them. The first several miles were the same as the half marathon course the day before. Of course we stopped in Magic Kingdom for a few pictures. For the sake of this post, we will be borrowing some photos from Marathon foto until we decided which ones we want to purchase. As we left MK, we headed on to the Disney Speedway. After the speedway it was about another 3 miles till we hit another park, which was Animal Kingdom. Before we actually entered the park there were some animals standing along the road ( with handlers of course) and some runners were stopping for pictures. Once we got into Animal Kingdom, we thought that was a good time for a bathroom break. There wasn't even anyone in the restroom we went to so we were able to get right in and right out. As we left Animal Kingdom, we approached the half way mark! After Animal Kingdom it was a pretty long stretch of road until we got to ESPN wide world of sports. It wasn't until we passed mile 15 that I turned to my sister and said "Ya know what, I might do this again". Of course I had 11.2 more miles to go, but I admit I may have been too quick to say that this marathon was a "one and done". As we were approaching mile 17, the announcer was telling runners that they were already at mile 20! Of course he was talking to the runners that were on the other side of the highway from us! Running through the baseball stadium at wide world of sports. I liked all the different surfaces we got to run on at wide world of sports. I actually picked up a little speed on my sprints as we were running around the baseball field. Chip and Dale were spotted up at wide world of sports and I thought it might have been nice to get a picture but it started to rain and I didn't feel like getting my camera out. In fact, we really slacked on taking pictures during this race. I know I didn't even make an attempt to look happy in the photos that marathon foto was taking. I was in pain when I was running but at least I was trying to manage it slightly. We stopped again for a potty break at wide world of sports. It turned out that the hydration belt that I was wearing kept pushing on my bladder and falsely kept making me think I had to go. We solved this problem by letting Lacey wear the belt the rest of the way. We didn't stop for anymore bathroom breaks after that! After leaving wide world of sports, we headed to Hollywood Studios, then the boardwalk, and then finally to Epcot. I know I really slowed down in Epcot because it started to rain and it was making the surface slippery. I really didn't want to wipe out when I was so close to the finish! 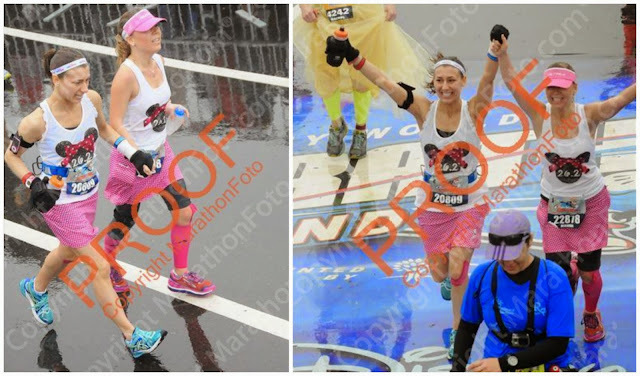 We decided that we were going to hold hands as we crossed the finish line. I totally expected to breakdown and sob after getting through this marathon in this much pain, but I didn't. I was just so happy that I did it. We did it! Yea, it wasn't the finish time that I had trained for, but who cares. 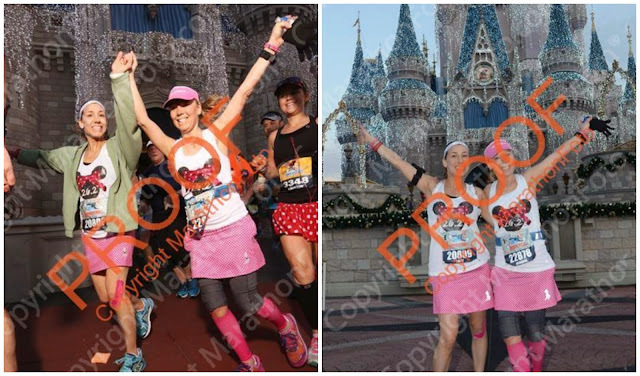 Considering that I was in pain, we stopped for pictures in MK, and we made two bathroom stops, I was pretty darn pleased! I was a volunteer the year that Lacey ran her first marathon, so I was able to present her with her first marathon medal. Of course it would only be right for her to present me with mine! I am very thankful that my sister put her own PR aside and ran with me at my pace. I know this was hard for her. She was actually starting to get tired. She is not use to being out on the course this long...lol. I am glad that it worked out that THIS was my first marathon. 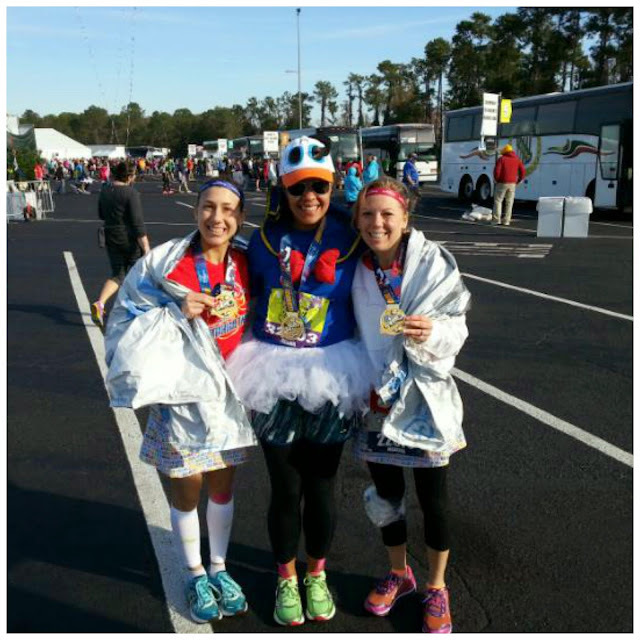 Disney was my sister's first marathon when she ran it a few years ago too! Now, this was her 10th marathon and the 10th anniversary of the Goofy Challenge which we both did. How fitting. We kid that we really got our monies worth out of this race. After we finished we got a few character pictures, went back to the finish line and waited for some of our friends to finish , then went to go get a massage. After that we watched the rest of the runners come in. We literally stayed till the end. Check out the group of runners who were dressed as chimney sweeps. 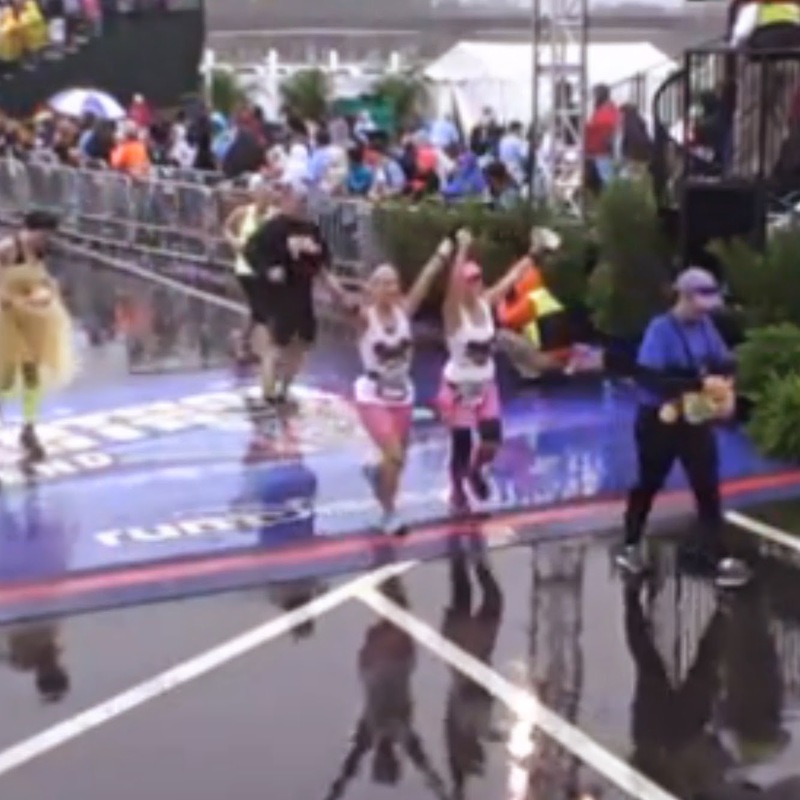 They were literally doing a little dance before they crossed the finish line! The medals we earned. Top left is the marathon medal. 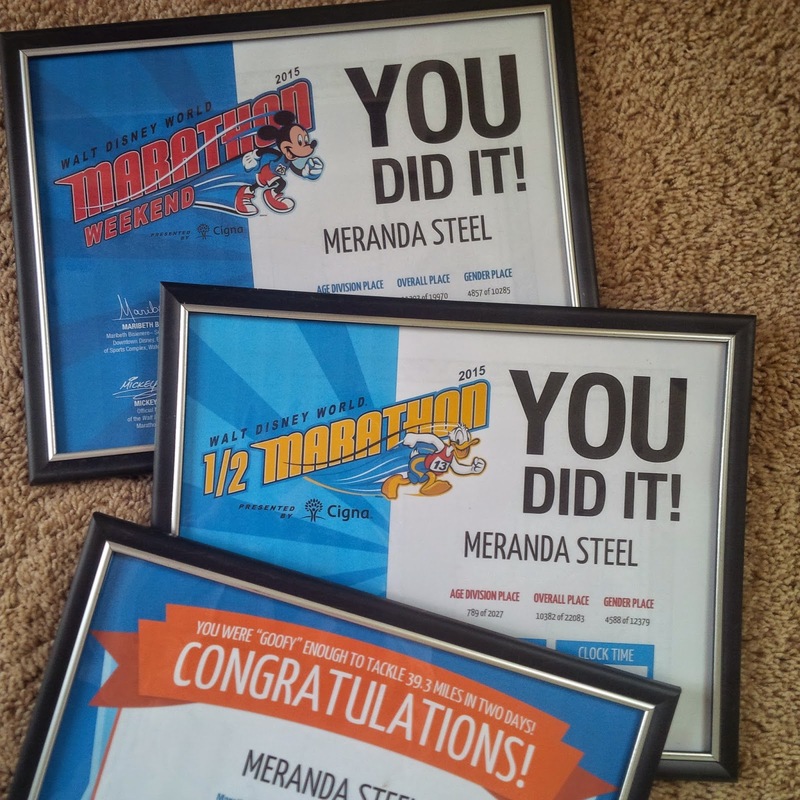 Top right is the half marathon medal. 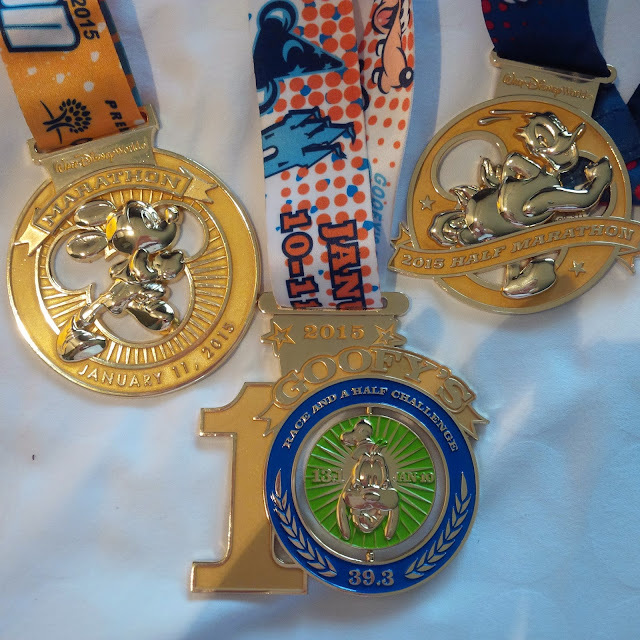 Center is the 10th anniversary Goofy challenge medal. How did you feel after your biggest race? 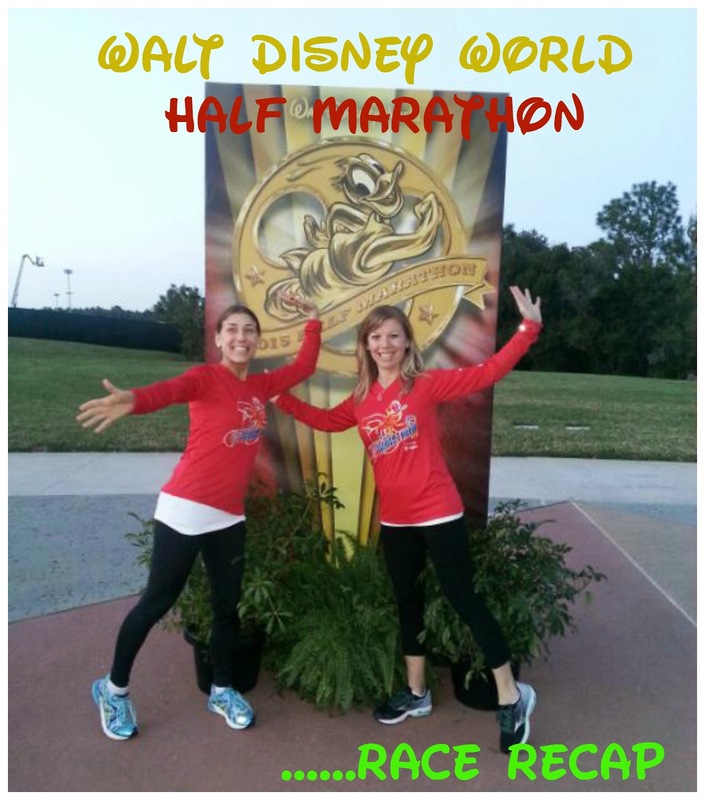 Click HERE to read about the Disney World Half Marathon that we ran the day before. 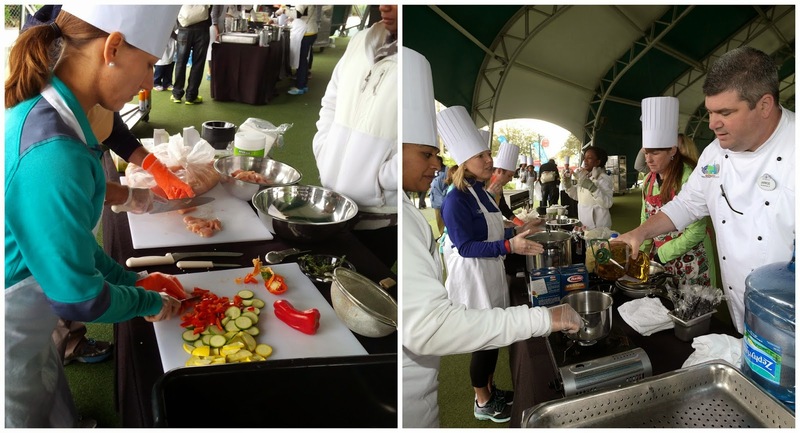 Click HERE if you would like to read about the Runner Cook off with Chef Mickey. 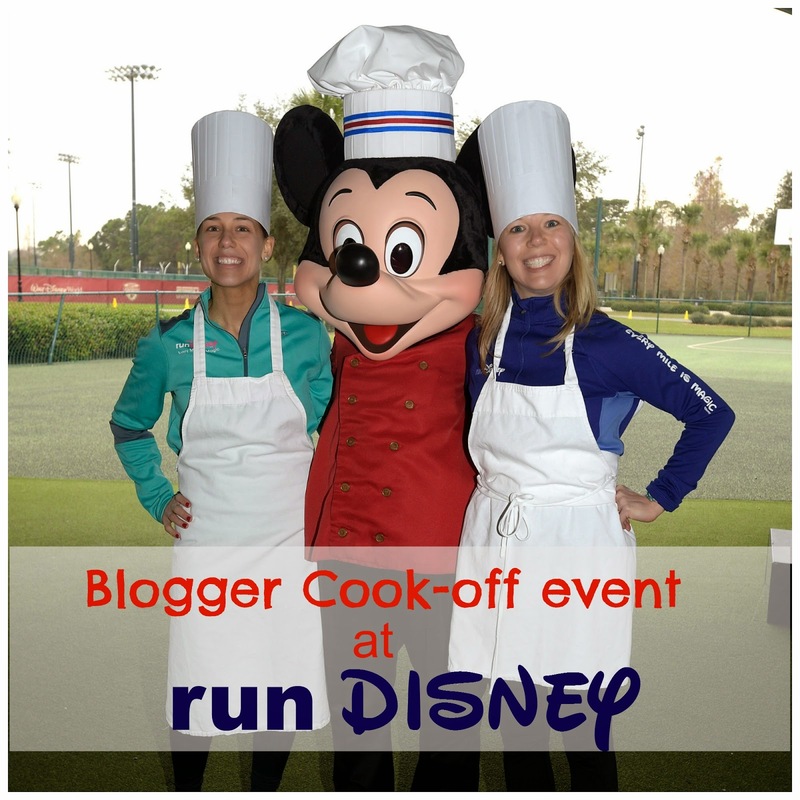 During Disney Marathon weekend we were invited to a blogger cook-off event. The event was held on Friday afternoon up at the ESPN Wide World of Sports complex. This was so much fun because we not only got to reunite with some running bloggers that we had met before but we also got to finally meet some running bloggers that we have been communicating with over social media for sometime now. The event was hosted by Cigna ( who is the sponsor of the marathon weekend). 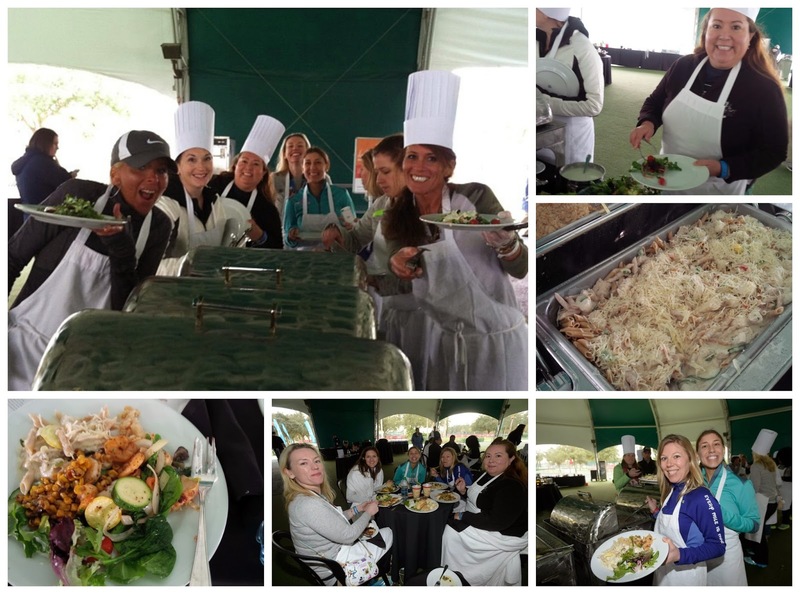 They organized it almost as if we were on the set of "Iron Chef" or "Chopped". We were all split in to several groups. I believe there were 5 or so groups and then a Vegan group. We each had a different "Special" ingredient that we had to use in our main dish. Then there was a vegetable table, a spice table, and a carb section. We also had a big fridge we could get in to find stuff like cheese and milk. Our "Special" ingredient was Chicken. I don't recall exactly how many pounds of chicken they made our group cut up and cook but it was A LOT. We were suppose to make a dish that would serve 40 people but I'm sure we had much more. 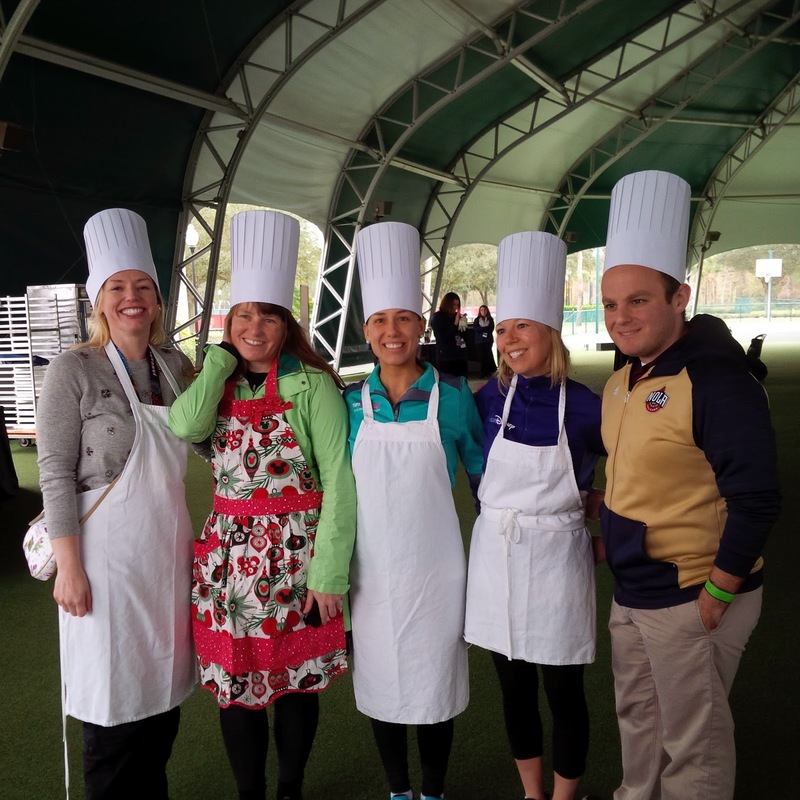 Each group had a "Master Chef" from Disney to help them with their dish. The dish we decided to make was a Chicken Alfredo with sauté vegetables. With a little help from Disney's Chef Jarrod, we even made the Alfredo sauce from scratch. When all the meals were complete, they were put in a buffet line for all of us to try each others creations. The Chef's also had made us salads, side dishes, and yummy desserts. We thought our Chicken Alfredo was yummy, but golly, ALL the groups made a yummy dish. I don't remember all of them but there was a grilled shrimp dish that really stood out in my mind because it was so fabulous! Kudos to the group who made that! This was our fabulous cooking group. 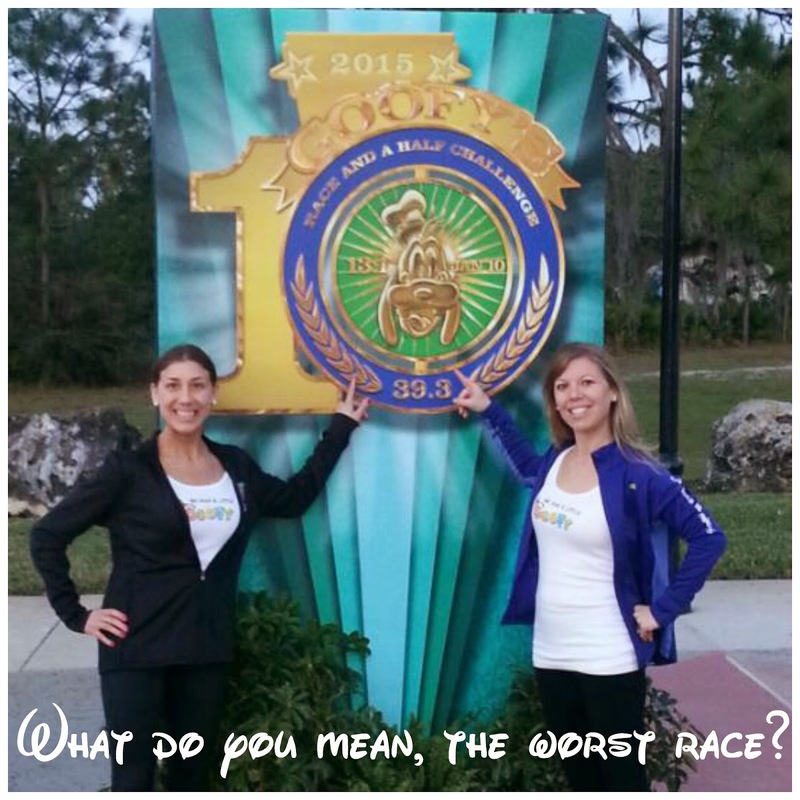 Denise from Healthy Disney Family, Erin from For the Love of Disney Running, Lacey, Meranda, and Fred from Nola Runner. We had such a fun time that we should have done something more to thank Cigna for inviting us to this great event, but instead, they thanked us all for coming with an extremely generous goodie bag! We didn't completely look into our bag until we got back to our resort and we were absolutely flabbergasted to find that we were given a $50 Disney gift card! Thank you Cigna! 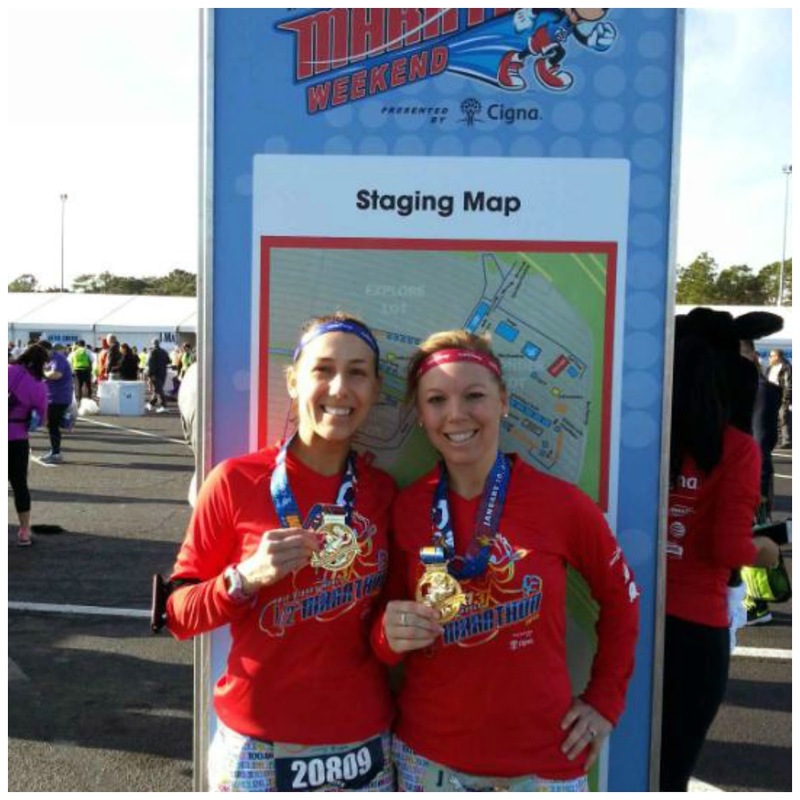 Did you attend Marathon weekend at Disney?